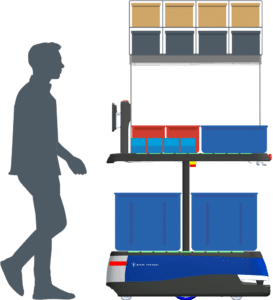 A Three-Level Chuck fulfillment robot such as customer ACT Fulfillment uses. WALTHAM, Mass. – 6 River Systems, Inc. (6RS), a collaborative robot fulfillment solution, has expanded its footprint to nearly 300 robots across 20 sites, and hired 45 new employees in 2018. 6 River Systems is on track to meet its goal of 600 robots across 30 sites by end of 2018. One customer, ACT Fulfillment, Inc., has been providing supply chain solutions in warehousing and fulfillment services since 1994. ACT wanted to invest in an adaptable robotics solution that could be deployed quickly for one of their high profile accounts. ACT was one of the first companies to deploy a 3-level Chuck, which the 3PL uses for shoe fulfillment. Configure your own bot. Chuck comes in a variety of new configurations and models. Customers may increase their bot’s workspace by choosing Chuck+, a wider robot. Or, they might add another level to create a three-tray Chuck configuration.